Field production of cut flowers, particularly annuals, requires many of the same soil fertility management practices as production of vegetables and other outdoor crops. The main goal is to maintain proper fertility to produce a good yield of high quality flowers for summer sales. Another goal is to maintain soil health and avoid environmental contamination by using fertilizers responsibly. Nitrogen. Adequate nitrogen (N) is critical for cut flower production. A N deficiency will result in poor plant growth, a reduction in flower yield, and the appearance of foliar chlorosis. Too much N may result in too much vegetative growth, cause weak stems, and delay flowering. Nitrogen is the most difficult nutrient to manage because it is required in the greatest amount by plants and is easily lost from the soil by leaching or as a gas. For these reasons N fertilizer must be applied each year to maintain adequate levels for production. Leaching of N as nitrate (NO3) can be a serious problem not only as a way of losing N for the crop, but also because it can pollute groundwater and surface bodies of water. Too much N fertilizer, high rainfall or excess irrigation, and sandy soil are all factors favoring NO3 leaching. Nitrogen fertilization also effects soil pH. Over time the continuous use of ammonium or urea fertilizers lowers the pH of the soil. The acidity is created because ammonium or urea are quickly converted to NO3 by soil bacteria and acidity is a byproduct of this process. Neutralizing the acidity generated by N fertilizers is one of the reasons for using limestone. Phosphorus. The effects of phosphorus (P) on cut flower production are less obvious than the effects of N. A P deficiency may result in smaller plants and shorter flowering stems, but foliar symptoms may not be apparent. Phosphorus is often said to be needed for flowering, but the exact effects of P on cut flower crops has not been studied. Less P than N is needed by plants and P is more stable than N in the soil. Some agricultural soils in Massachusetts test "very high" or "excess" in P because of the regular use of NPK fertilizers over many years. Generally, the potential harm caused by high P is not to the plants, but to the environment. Too much P can lead to runoff to surface bodies of water. This encourages the growth of too much algae and other aquatic plants which leads to a serious decline in water quality. Nutrients should be applied based on need as determined by a soil test. Unlike N, an application of P may not be needed every year. Superphosphate is a water-soluble P fertilizer and is best used to correct a low P condition before planting. Rock phosphate is not water-soluble and it is best used for the long-term maintenance of P in the soil. Potassium. Potassium (K) deficiency causes marginal chlorosis and burning on the lower leaves first. Unless the deficiency is very serious it may not effect the leaves on the flowering stems, but it could reduce overall yield. Potassium deficiency is most likely to occur on sandy soils low in clay and organic matter. Soils lacking in clay and/or organic matter have a low cation exchange capacity (CEC) and have little ability to retain the cations (i.e., positively-charged ions) such as K, as well as calcium (Ca) and magnesium (Mg). It may not be necessary to apply K fertilizer to some clay soils and soils high in organic matter every year. To the author's knowledge there is no harm to the environment from excess K and no direct harm of high K to most plants. However, too much K can depress the uptake of Ca and Mg, sometimes to the point that deficiency symptoms of these elements develop. A yearly soil test for pH and nutrient levels should be made in either the fall or spring Since P, K, Ca and Mg are fairly stable in the soil a fall test gives a good reading on the status of these elements for next spring. If needed, limestone or rock phosphate can he applied in the fall giving these materials a head start in reacting with the soil before spring. Since the status of N is very changeable, a spring test or one right before N application is best. Soil should be collected from about 10 randomly selected spots in the cut flower field and from a depth of about 6 to 8". The 10 subsamples should be mixed together into one sample to send to the UMass Extension Soil and Plant Nutrient Testing Laboratory. Checking pH and adjusting it by liming is important in managing soil fertility. The general acceptable pH range for flower crops is 5.5 to 7.0, but some plants may have particular optimum pH levels for best performance. pH affects the availability of trace elements and the activity of many beneficial soil microorganisms. Phosphorus availability is highest between pH 6 and 7, so liming an acid soil may help free some plant-available P.
In addition to raising the pH of acid soils limestone serves as fertilizer for Ca and Mg. As a soil becomes acid it also supplies less and less Ca and Mg. Regular use of N fertilizers hastens the formation of acid soil as discussed earlier. Use finely ground dolomitic limestone or calcitic limestone with 5-10% Mg to get both elements. Ideally pH should be checked once a year either in the fall or the spring. If the pH is not in the desired range a lime requirement test (buffer pH) can be rim to determine how much lime is needed. These tests take into account the soil texture- sandy soils need much less limestone to cause a pH change than soils high in clay or organic matter. The table below can help determine the approximate amount of limestone to use if the soil texture is known. The goal of fertilizing outdoor cut flowers is to provide adequate levels of nutrients for vegetative growth early in development, strong stems, and a good yield of flowers. Annuals. Annual species are started from either seed or transplants. Germinating seeds and young seedlings are very sensitive to fertilizer injury so the amount of fertilizer put on initially should be very small. Starter fertilizer should be applied at a rate of about ¼ - ½ lb. of actual N/1000 sq. ft. at seeding either by broadcasting or banding. Bands should be placed about 2" below and to the sides of the seeds. More fertilizer would be applied later after the young plants are well established. If annual transplants are used to start the crop about 20-30% of the total N requirement can be applied shortly before planting assuming the transplants are healthy and have been hardened-off. Another one-third of the total should be applied as a sidedress when the transplants are about 8-10" tall. The final application should be made with about 4-6 weeks of harvest left to go. Can one application of N fertilizer at transplanting grow a good crop? "Yes" is probably the answer in many cases. However, the split application method is a more efficient means of applying N fertilizer in fields receiving heavy irrigation or rainfall or that have sandy, well-drained soil. Split application provides a more consistent supply of nutrients than one large application at planting. Perennials. In general fertilizer is applied to encourage shoot development when growth begins in the spring. Approximate amount of limestone need to change soil pH and to support the flowers as they develop. After flowering or harvest most perennials continue to grow building the root system and expanding the crown or other overwintering structures. An additional application of fertilizer is needed to support preparations for winter. So the total fertilizer requirement might be divided as follows: a small application in the spring as growth begins, a sidedress application as the plants approach flowering, and another application after harvesting ends. Rates of application. In his book on field grown cut flowers, Stevens (1998) recommends fertilizer be applied at 1 to 2 lbs. actual N per 1000 sq. ft. for a diverse group of annuals and perennials. At the 2 lb. rate this would be 20 lb. of 10-10-10 fertilizer. Some large, and fast-growing annuals like sunflower may need more and it can be added as a sidedress if necessary. As in greenhouse practice complete NPK fertilizers are applied to outdoor cuts according to the N requirement. Ideally, however, P and K should only be applied if their need is indicated by a soil test. So rather than using 10-10-10 a grower could use single element carriers such as ammonium nitrate, superphosphate, and potassium chloride to fulfill the exact needs according to a soil test. Winter rye. Winter rye has been an old stand by. It can germinate and make quite a bit of growth, even if planted as late as October. Winter rye is efficient at taking up left over nitrogen. It remains green over the winter and resumes growth early in the spring. It adds little organic matter if plowed under in early spring while still small. If allowed to grow until late may, it can reach three to four feet and contribute a fair amount of organic matter. Unless plowed under while quite small, it can be difficult to break up the clumps of winter rye, making it difficult to seed crops. Winter rye is a popular cover crop, but others can be used starting in the summer. Oat. This is a very useful cover crop for us in Massachusetts. Unlike winter rye, oat will grow very vigorously and straight up when seeded in the summer. We frequently seed this cover crop during the summer months at the Research Farm in South Deerfield on land that is not in production. Seeds are readily available, but beware that you do not get oats that have been cooked for use as animal feed. Oat seeded in the summer will probably produce viable seed before frost. For this reason you might want to incorporate it (or simply mow it) before it goes to seed. Seeding rate- 100 lbs/acre. Sorghum x sudangrass. As the name implies this cover crop is a cross between sudangrass and forage sorghum. One nice aspect of this cover crop is that the seed produced is sterile so there is no concern of it going to seed. When seeded in mid-June it can get eight feet tall! There has been some concern about how to manage it in the fall. 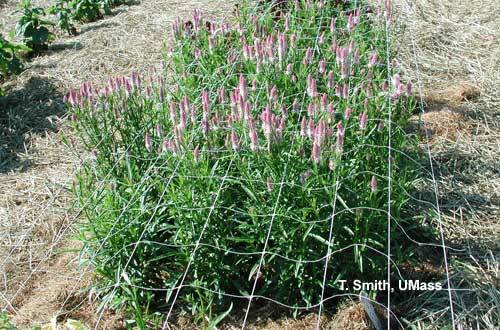 Experience with this cover crop has been that it is not difficult to manage, however you may want to seed a little of it the first time in order to get some experience with it. It will die with a hard frost. You can either leave it and till the following spring or incorporate it after a frost and seed rye. Seeding rate- 50 lbs/acre. The Massachusetts Department of Agricultural Resources (MDAR) has developed statewide plant nutrient regulations to develop regulations to ensure that plant nutrients are applied in an effective manner to provide sufficient nutrients for maintaining healthy agricultural and non-agricultural land, including turf and lawns, while minimizing the impacts of the nutrients on surface and ground water resources to protect human health and the environment. The Act and regulations (330 CMR 31.00) establish standards for the applications of plant nutrients to agricultural land and non-agricultural turf and lawns. For information about the regulations from MDAR see: https://www.mass.gov/plant-nutrient-management. See: Nutrient Management for Field-Grown Cut Flowers for information about complying with these regulations for field grown cut flowers. Steven, A. 1998. Field grown cut flowers. Avatar's World, Edgerton, WI. Howell, 3. 1998. Soil basics part Ill: Organic matter: Key to soil management. UMass Extension. VegSF3-98. Mangan, F. and R. Hazzard. 1996. Fall cover crops. Veg. Pest Message. 7(17):l-2.